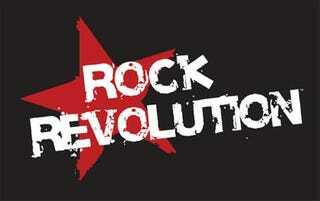 Oh boy, Rock Revolution for the Wii. With Guitar Hero and Rock Band solidifying the upper echelon of music console gaming, and with Wii Music looking more like it's geared toward a much younger audience, where does Konami's new game fit? Well, right in the middle, in fact. But in this case, I'm not so sure that's necessarily a good thing. There was a demo set up at Nintendo's party on Friday. There were no Konami representatives on hand, and the game was tucked away behind a pillar of DS games. Is that a good sign?The gameplay screen setup is what we've all seen before. During a song you'll have your band in the background jamming out with a bunch of cascading tiles coming towards you. I can't speak for the PS/360 versions - since those have five or more columns of cascading notes - but the Wii version only has three sets of columns, and it makes playing any song on harder difficulties a lot less satisfying when you don't have to worry about mastering a new column set of cascading notes. Also, let me just get this out of the way. Playing air guitar and drums aren't fun. I tried not to hate it. But there's something about sitting down at a drum kit or pulling a guitar over your head that makes the overall experience more engaging. Whether you're playing guitar or drums, you'll either be holding down the C or Z buttons of the nunchuk while moving the Wii-mote up and down (to mimic strumming), or shaking both like maracas while incorporating the B button. It would be fine if I could use my other instruments to play this, like the PS3/360 versions, but I can't. The Wii version only allows for use of the Wii-mote and nunchuk. The main problem, besides my arms getting wicked tired, is that in games like this, accuracy is the most important thing for the controls, right? Sometimes, when you swing your wii-mote down, the game doesn't register it, so you then of course miss notes. I can see the audience for this version being for those who are too young for Rock Band/Guitar Hero and too old Wii Music. It might fit snugly in there. But if you're thinking Rock Revolution for the Wii might contend with the other big boy on Nintendo's platform in terms of realism, accuracy and overall enjoyment, you might want to look at the other versions.